Ireland Lake is a quiet, remote lake set in a surreal landscape of rolling, alpine meadows and rocky mountains. Take the spur trail south to the John Muir Trail and make a left to follow the Dana Fork upstream. The trail crosses over the Dana Fork before going up and over a small, wooded rise to the Lyell Fork and the wonderful twin bridges. A beautiful meadow spreads out on the other side and is a brief preview of the rest of the canyon. After about 1mi/0.6km in the trees, the trail opens to the many meadows of Lyell Canyon (see Lyell Canyon). Just before Ireland Creek, take the signed trail to the right that switchbacks up along the creek through the trees. The trail leaves the creek to gain some more elevation to the spur trail for the lake (the distance to the lake from here is 1.6mi/2.6km, not the 3.0 miles stated on the sign). The forest is exchanged for vast, alpine meadows scattered with boulders. Mountains explode into view; particularly Amelia Earhart Peak to the southeast. The trail rolls over a hill and the lake comes into view. The sublime meadow continues all the way to the lake. A crumbling rock wall towers over the far side. Turn around and head back the way you came. 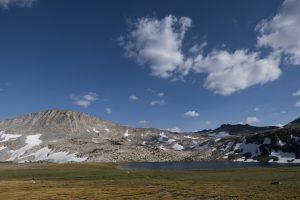 Alternatively, turn this into a 22.5mi/36.2km loop by returning back to the junction, then continuing on the trail to Vogelsang High Sierra Camp, then descend via the Rafferty Creek Trail (see Vogelsang High Sierra Camp).